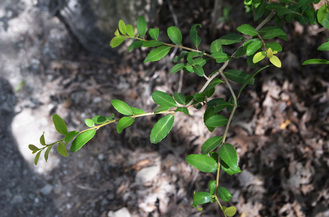 This evergreen shrub has smooth light gray bark and dark shiny leaves. From late summer through winter, bright-red berries appear. These berries provide food for raccoons, ringtails, squirrels, and many songbirds. It is a particularly important source of food for some species since the berries are present throughout the wintertime. The yaupon is one of the most frequently grown shrubs in Texas, and it can be found throughout the southeastern United States. Have you noticed yaupon tea being sold in local Austin-area restaurants? Yaupon is the only native plant to North America that contains caffeine, and the Native Americans used the leaves to make a potent, highly caffeinated tea. The tea was known as "black drink" even though it is really a yellow or greenish color. It was used socially, mostly for men, for its caffeine, and as a medicine to induce vomiting, especially in the context of ritual purity. The scientific name vomitoria refers to this effect. However, the vomiting was self-induced or because of other ingredients added; it does not actually cause vomiting. While commonly used for ritualistic purposes, the tea was commonly drunk as a daily beverage similar to coffee drinking today. Later the Spanish colonists adopted the drink as well. 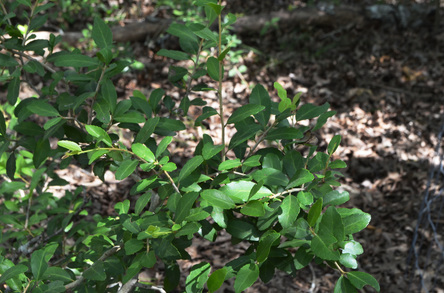 How to identify yaupon holly? Leaf around 1.5-2 inches long and oval shaped. Leaf edges are lightly toothed or scalloped. Leaf color is dark green with leathery appearance and a lighter-colored underside. Surface of leaves smooth (not rough or fuzzy). Bush or small tree structure, usually no higher than 25 feet. For more information about the Yaupon, click here.